After our truffle hunting adventure, we decided that we had to enjoy the fruits of our labor and so bought a (very small) truffle. The fact that we had no clue what to do with it didn’t stop us. Truffles are about smell, and not so much taste. So when preparing dishes, the objective is to get the dish to absorb their smell. 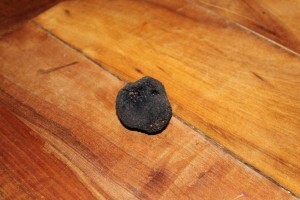 Don’t overcook truffles – you lose all the flavor! Now I prefer not to cook them at all. Other folks make mashed potatoes with truffles (I tried, but we didn’t get much of a truffle taste, perhaps because we overcooked them). 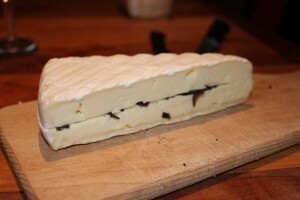 Slice a wedge of Brie along its length (cross-section). 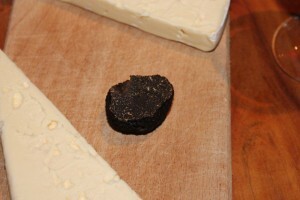 A sign of quality for black truffles is the number of nervures (white veins) the mushroom has. The more the merrier (and tastier). 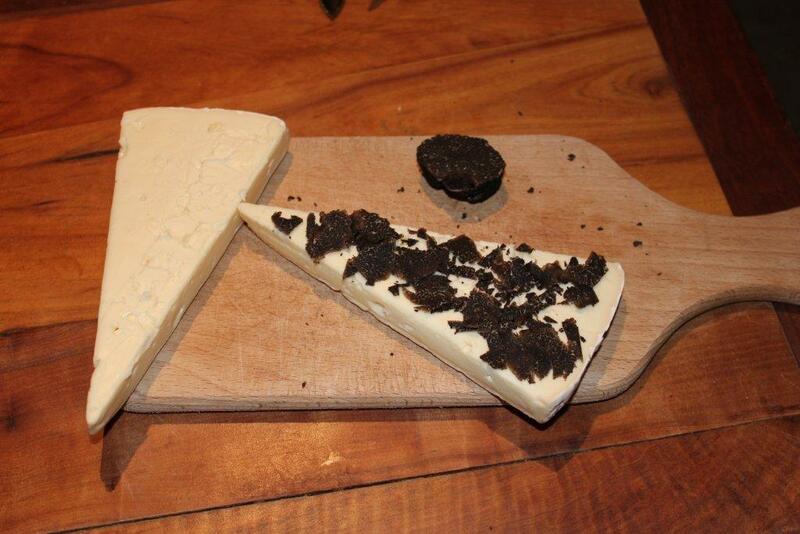 Shave thin slices of truffles on the inside of the brie. The thinner the slices, the better. The idea is to maximize the mushroom surface area exposure to the cheese so as to transfer the mushroom smell to the cheese. Finally, wrap the cheese in a plastic wrap (saran wrap or equivalent) to seal it. Store in the fridge for at least 24 hours – two to three days is even better. This gives it time to impregnate the truffle smell properly. 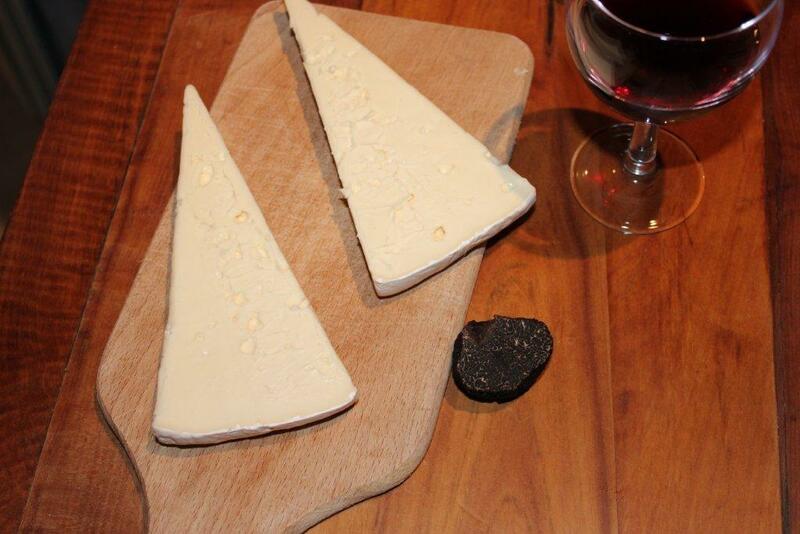 Now you can proceed to a legendary dégustation with a glass of Côte du Rhône for proper pairing. Mmmm. C’est délicieux! A truffled omelet sounds promising too! Hi Krista, Good luck in Australia! I absolutely love it there. I think as a Canadian it’s easy to feel at home – especially compared to the US. You’re becoming quite the foodie Diane! Very inspirational and timely: just bought a “canned” truffle at Gourmet corner and wasn’t too sure how to best use it (of course, it’s not the greatest quality, nor fresh!) It’s a great start! Take care and bonjour to JM and the girls! Hi Lisane. According to Gilbert, a local farmer that JM runs into in the morning when he goes to pick up the bread, and who I get updates from, you can vacuum pack truffles and then freeze them and they’re like fresh when you open the pack later. But he has some kind of super-expensive farmer vacuum thing so we’ll probably never know. That brie sounds terrific! Maybe one time instead of going to a restaurant for book club, we could host an hors d’oeuvres party featuring the brie… I’ll bet we’d get 100% turnout for that one!